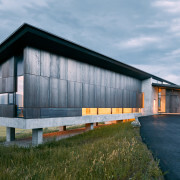 To meet the owners request for a maintenance-free home, Abramson Teiger Architects specified Corten steel panels, concrete and a zinc roof in the design of this home. The guest wing seen here on the left is raised on concrete columns to minimise the buildings footprint on the site. As we become increasingly aware of the negative effects our actions can have on our world, many of us are responding by wanting homes that sit lightly on the land'. 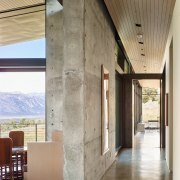 It's a phrase that can encompass a number of architectural aspects and many of those were integral to the design of this new home by Abramson Teiger Architects. 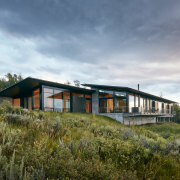 Design principal Trevor Abramson says the primary goal of the project was to craft a maintenance-free home that suited the owners' active lifestyle while respecting the natural habitat. "It's a beautiful site that looks out over a protected nature preserve down to the valley, with mountain views beyond so it could never be built out," says Abramson. But it did come with zoning restrictions it needed to be secluded from the ridgeline and hidden from the valley floor below. This, combined with the aim to maximise views, determined the position of the house on the site and its layout. "Also, the owners' request to have no stairs, despite the sloping site, meant the house would have quite a large footprint." To help accommodate these factors, the garage was pushed back into the hillside, and landscaped over the top so that it is hardly visible. The entrance to this home provides perfect access when the owners or guests arrive back from nearby ski fields, including easy access to a mudroom. 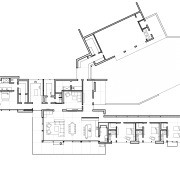 The main living area was allocated the prime viewing corner, with the master suite then placed at one end of the home and a guest wing at the other. It's this guest wing, clad in slowly weathering Corten steel, that greets visitors to the home, says associate principal David Pascu. "The guest wing is raised off the ground, up to almost 2.5m. We could have had the walls continue down to grade, but we wanted to minimise the footprint on the land. 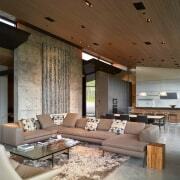 We liked the idea of seeing underneath a portion of the house to glimpse the views when you arrive," says Pascu. 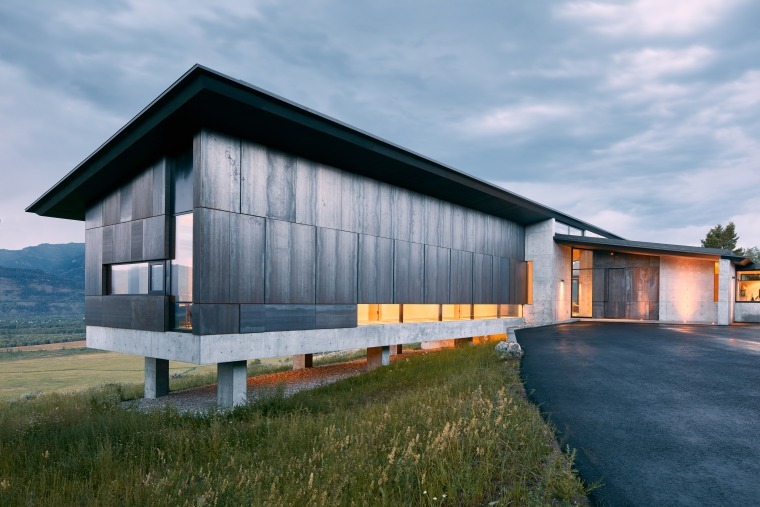 The Corten steel also meets the request for low maintenance materials, as do the zinc roof, the architectural concrete walls and the polished concrete slab that extends throughout the house. 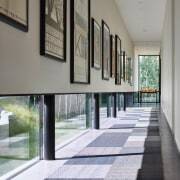 Another restriction on the design stipulated a maximum ratio of 30% glazing for the house, though that could be exceeded if measures were taken to ensure the house performed well thermally. By having the arrival facade primarily presenting a blank face, the view side of the house could be almost fully glazed. "But we did go over the 30% fenestration because there was such value in having as much glass as possible. In turn, we used triple-paned glazing with two layers of argon gas between, which has a higher insulation value than is typical." 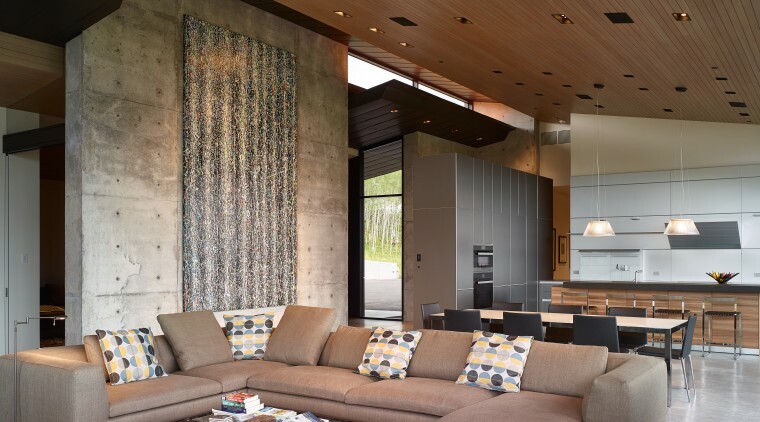 Other environmental and sustainability elements in the design include hydronic in-floor radiant heating as well as installation of a geothermal system which makes use of the natural temperature difference in the earth to heat and cool the home. The main entrance to this home can be seen in the centre of this image. 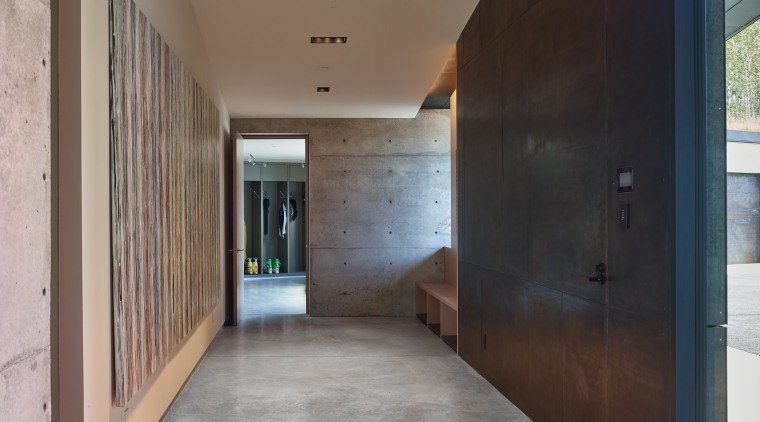 Polished concrete is the homes principal floor material and was poured in one complete level throughout the house as the owners wanted no stairs or steps. Panel-formed concrete was poured on site for the walls. The wall seen here was designed specifically to display an artwork that is almost 4m high. An insulation layer placed between the concrete foundations and the concrete floor creates thermal separation and prevents heat loss underneath the house. And a rain screen system is used to minimise thermal bridging from the exterior steel cladding. The steel panels are mounted on a system of battens allowing air to circulate between the panels and wall. This reduces heat transfer and removes moisture. 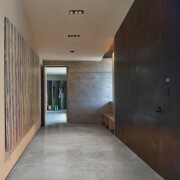 David Pascu says that the key to the success of the design of the house lies in its simplicity. "We didn't try hard to force anything into the design. We simply followed the owners' brief and added some nice touches in the details and the materials just work really beautifully together. "You couldn't really lose when you're given a site like this. It's probably the nicest site I've ever had to work on."